Ocean kayaks are relatively different to the other type of kayaks available on the market. 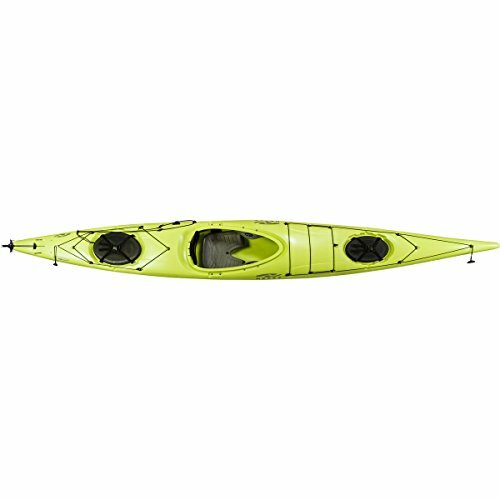 These kayaks are typically for individuals who are a little bit more experienced and capable of handling a more complex vessel. As ocean kayaks contain specific features, you need to be careful about the ones that you decide to purchase. I have found that there are certain elements that are absolutely crucial to the best ocean kayaks. This includes excellent tracking, a fair amount of speed, and an ability to withstand harsher weather conditions. Although the Advanced Elements AirFusion Elite is classified as an inflatable kayak, it is more of a hybrid version. This is because although you need to pump it up, it does contain a frame constituted of aluminium poles. Due to this, the kayak offers much more rigidity than a typical inflatable kayak. Especially considering that the shell of the kayak is made from polyethylene. The AirFusion Elite is thirteen feet, which is a little smaller than most sea kayaks. While this does cut down on some of the speed that you can pick up, I did find that it was easier to maneuver than other vessels. Since there is less kayak to contend with, you will not have to exert as much effort. In particular, smaller kayakers will find this useful. While the setup process is a little more complicated than most, the kayak still only weighs a little over 30lbs. Nonetheless, the vessel comfortably carries around 235lbs. The AirFusion Elite also has an optional fixed skeg. This does come in handy when you are attempting to stay on course in the ocean. This kayak performs best on calmer waters. However, it is still plenty able to tackle waves a couple of feet high. Another enjoyable feature on the vessel is the storage hatch, which is not typically found on inflatable crafts. Still, it does allow for plenty of space to store your items. The Necky Elias Kayak strikes a nice balance between a touring vessel and ocean kayak. It has the dimensions and storage options of a touring kayak. At the same time, it comes equipped with a rudder to help you maneuver through tougher weather conditions. At fifteen and a half feet, this vessel is great for those whose main focus is speed. I found that the kayak moved quite fast on open water. Not only that, it took a lot less effort to maintain a comfortable speed as well. The width helps to balance out the rather long bow, which adds a great amount of stability to the Elias. This rudder not only improves the tracking of the vessel, it also makes the kayak easier to handle when the wind picks up. This is quite useful considering the overall length of the kayak. One of the definite perks of the Elias is its cockpit. Now, the cockpit has been built keeping those who are taller and bigger in mind. This means that small to medium kayakers may find this space a little too roomy. If you are looking to stretch out, however, this kayak is perfect. The seat is also comfortable and is quite suitable if you plan on spending a lot of time in your kayak. Another nice touch is the two hatches, one in the front and the back in the kayak. There is more than enough room for whatever you are carrying. 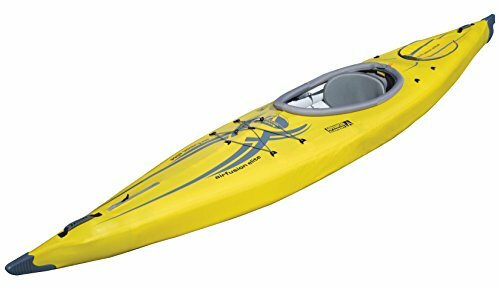 The Perception Essence kayak is yet another one of those vessels that tick all of the right boxes. It has a lot to offer, especially if you have a little bit more experience under your belt and are able to appreciate all of the features. At sixteen feet long, this is a kayak that fits kayakers of all shapes and sizes. Due to the length, however, it can be a bit of a handful to those who are not used to such vessels. There is a lot of relief to be found in the TruTrak skeg system, nonetheless. The skeg on the Essence is retractable. However, lowering it can greatly help with directional tracking. Despite the size of this kayak, it is surprisingly maneuverable. This means that it will work quite well in conditions other than the ocean as well. The Essence has a slight edge over the competition in terms of longevity. This is the type of kayak that you can use for longer journeys. This is in, no small part, due to the plenty of storage available on the kayak. There are three sealed bulkheads to make sure that all of your belongings are kept dry throughout your journey. There is also plenty of bungee cord that helps you to carry larger pieces of equipment with you. The cockpit of the vessel is particularly comfortable. There is ergonomic seating which is adjustable, allowing you a more custom fit. The only downside with this vessel is the sheer weight of it which is almost sixty pounds. The main purpose of the Tahe Marine Wind 535 kayak is speed. After all, that is the goal of the Wind series in its entirety. This objective is carried out perfectly with this vessel. This largely due to the shape and the design of the 535. Its long and narrow V-shape encourages acceleration, allowing you to pick up speed that much faster. I was also surprised to learn that despite the rather cumbersome length of the vessel, it was actually quite maneuverable as well. The 535 has a retractable skeg which is quite helpful. Whether you are looking to stay on course or aid in handling the 535, the skeg works out well. The cockpit of this kayak has been built with larger passengers in mind. Therefore, if you typically have problems in fitting with other kayaks, you should be accommodated with the 535. The cockpit also features thigh braces. This provides you with greater control as you are paddling. The seating is not bad but because it isn’t overly padded, it can get a little uncomfortable after a while. The vessel also boasts a considerable amount of storage options. There are two, sizable oval hatches, a mini-box, and plenty of bungee cord for whatever you want to store. Now, the kayak is not overly light but considering its dimensions, it isn’t too heavy either. This is because the kayak is made from composite materials. Ultimately, however, the thing that makes the 535 stand out the most is its rather unique ability to balance both tracking and maneuverability. This is not something accomplished by most kayaks. 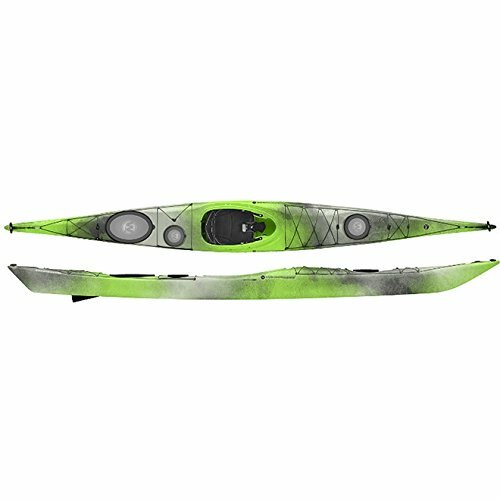 The Wilderness System Tempest 170 kayak is a great option for those who are looking for comfort as well as manageability. On the surface, the Tempest 170 doesn’t look as though it is the easiest vessel to manage. While the kayak does measure in at 17 feet, it has been designed in such a way that you still get to experience enough of stability. This kayak boasts a TruTrak skeg system, which is a retractable skeg. This means that when you need a little help on the water, the skeg does help quite beautifully. It helps to improve the tracking quite well. You will also not have to worry about the potential for weathercocking in bad weather. As mentioned the Tempest 170 has also been designed for comfort. It’s spacious cockpit ensures that most passengers will have more than enough room. The seating is Phase 3 AirPro XP which is undoubtedly one of the most comfortable kayak seats on the market. There are also adjustable thigh braces to help make your paddling more efficient. The other high point of the Tempest 170 is the storage options. There are three separate hatches to store items or equipment of varying sizes. To top it off, you can ensure that your belongings will be mostly dry. If you are looking to store larger pieces of equipment then there is a lot of bungee cord available too. The kayak weighs around 57lbs and is able to carry around 325lbs in passenger weight. The Tahe Marine Reval HV kayak is a British-style sea kayak. It is also made from composite material. This means that though the Reval HV is a sizeable kayak, it is still relatively light, compared to what it could be. At over 17 feet and 56 pounds, this is not exactly a lightweight vessel. Nonetheless, the unique shape of the bow and the stern does make it a little easier to carry this kayak. The Reval HV comes equipped with both a skeg as well as a rudder. This is so that whatever weather conditions you encounter out there on the water, you will have no issue steering the kayak in the right direction. These features came in especially handy when I realized that left to its own devices, this kayak had a tendency to turn with the wind. When I dropped the skeg, however, this was immediately corrected. The rudder also helps with maneuvering the kayak along. The seating in the cockpit makes it comfortable enough for you to last through the longer journeys. The cockpit also has plenty of room for passengers of all sizes. This sea kayak is meant to be taken out for longer periods of time. This is why there are two large hatches and one small one where you can store your items. The bungee cord provides additional space for you to place large or odd shaped items. There are several things that you need to take into consideration if you want to get an ocean kayak that is right for your expeditions as well as your capabilities. There are three main types of ocean kayaks available. However, these terms are typically used to loosely describe the various features on kayaks. Not all designers or brands really subscribe to these labels. The three types are Greenland, British, and North American style kayaks. A Greenland kayak can be recognized by an upswept bow, hard chines, and a lower volume foredeck. The British style is quite similar to the Greenland version except that it has more rounded chines. The North American version, by comparison, has softer chines and is even more voluminous than the above styles. In the past, these terms have been used to determine in which type of ocean conditions these kayaks would perform best. On average, Greenland and British styles have been better suited to choppy waves and rougher conditions. The North American style was strictly used on calm, open water. As mentioned, however, designers and builders aren’t really sticking with by these rules or these terms much anymore. This is why you shouldn’t go by the labels that are present alongside the kayaks. It is easy to notice that sea kayaks, especially those with a focus on touring, are longer than most other kayaks. There is a reason behind these more elongated designs. Also, paddling is easier as there is a more efficient transfer of energy. It is still good to maintain a range, nonetheless when considering kayak lengths. For instance, to reap all of the benefits that an ocean kayak provides, it is best to choose one that is between 13 and 18 meters long. What you should be aware of is at these lengths, there is a slight concession in terms of stability. At the same time, you shouldn’t completely forego the concept of stability as it does add to your safety. This is why it is best to aim for a vessel that is between 20 and 30 inches wide. Anything more than that and you can expect your kayak to slow down in the water. There is no denying that both of these components are important in any kayak. However, the unique conditions of the ocean do impact on which is more vital to you. In most instances, when you are in the open water, you will find yourself choosing tracking over maneuverability. This is because there is not much opportunity for you to turn in the ocean. However, it is imperative for you to stay on course, even when the water and the waves get choppy. This is a debate that continues even now – the question of whether skegs and rudders are actually required with your kayak. One of the reasons that this argument is still ongoing is due to certain beliefs. There are many kayakers who believe that having assistance from additions such as skegs and rudders can actually prevent you from being a great kayaker. They are of the opinion that reliance upon such features can get in the way of you learning the necessary skills. This isn’t true and there are many individuals, experts and novices alike who rely on skegs and rudders with great success. Most kayaks have retractable skegs or rudders and these are perhaps your best option. This is because you can drop the skeg when you need to and then retract it when you no longer require tracking. Some ocean kayaks such as the ones that combine sea and touring kayaking, will offer greater storage options than others. There will be at least one hatch on the kayak. This is so that you can keep your belongings relatively dry. That being said, not all of these hatches are designed equally. Some are more waterproof than others so it is important to check. The other storage option that you have is the bungee cord crisscrossing the kayak. You should avoid putting too many items in storage hatches that store the items in the below deck. All of this will constitute as additional weight and will impede the overall performance of the kayak. It should be said that ocean kayaks are not really suited for beginner kayakers. This is because they are longer and heavier, making them a lot more difficult to manage. When you add wind and waves to the equation, it can be a recipe for disaster. This is why you should wait until you have gained some experiences with smaller, lighter vessels before buying an ocean kayak for yourself. This is all that you need to know about ocean kayaks including which ones would be right for you. Remember to always make smart and safe decisions when it comes to your kayak. When Is The Best Time to Buy a Kayak?